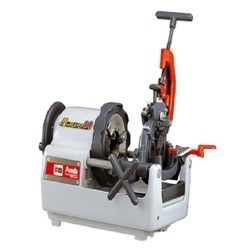 We are engaged in manufacturing, exporting and supplying of Electric Pipe Threading Machines. They are manufactured using top quality raw material procured from certified vendors of the industry. They are offered at highly affordable prices. Bolt Threading Machines made of cast aluminium alloy light weight, easy operation, good safety & low noise, are offered by us. We use international advanced technology suitable for threading requirement of pipe & bolt both for BSPT / NPT / MM / BSPP / BSC providing one set of Die head with machine for BSPT or NPT & Bolt die head for various thread can be order separately. Dependable clamping are free from slip & deformation. Self-lubricating die head & two more additional functions are pipe cutting & De-burring of pipe. With vast experience, we manufacture, supply and export a wide array of Electric Pipe Threading Machines. These machines are bound with varied features due to which the range is appreciated in national as well as international market. Some of the features include high tensile strength, corrosion resistant, sturdy construction and excellent performance. We offer the product at highly reasonable prices. 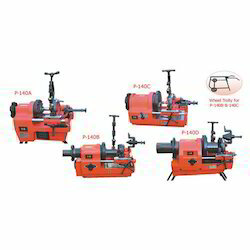 We made our mark in the market by offering an exclusive range of Pipe Threading Machines. Client stands on paramount importance to us, thus we manufacture the range as per their requirements. Our supreme quality range has earned us the accolades of clients from national and international market. Excellent functionality and durability of the range has made it the first preference of the customers. 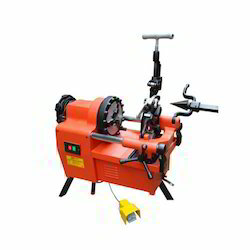 Our clients can avail from us a comprehensive array of Electric Pipe Grooving Machines which are manufactured with the use of latest and advanced techniques, machinery and technologies. Quality is of crucial importance to us therefore our quality analysts conducts stringent quality test at various levels of production. We offer the range at market leading prices suiting the pockets of the clients. Backed by vast experience, we manufacture, supply and export the most exclusive range of Multi Electric Pipe Grooving Machines to our customers. Considering quality as a journey and destination, we take all possible steps to improvise the quality of the range in order to deliver the customers better than the best. In order to attain customers’ satisfaction, we also customize the range in accordance to the specifications made by them.